The importance of having more women in tech positions is a much discussed topic and there are plenty of projects in Berlin, Europe, and the rest of the world dedicated to helping women learn to code and join local dev communities. Rails Girls Berlin is just one of them, but its achievements are notable. 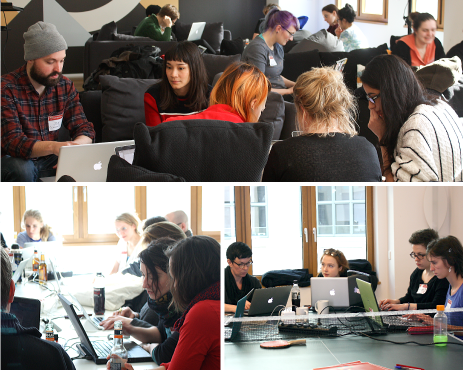 We caught up with Rails Girls Laura Laugwitz and Magda Frankiewicz at their latest workshop hosted at Fyber’s Berlin HQ. The women are members of the organizing team and we were keen to hear about their journey to becoming Rails Girls and learning to code. Can you tell me a little bit about yourself and how you found out about and joined the Rails Girls project? Magda: I first joined Rails Girls Berlin as an organizer. I heard about the project, but had never attended a workshop. I thought I could just help out on the organizational side since I didn’t know how to code and had no engineering experience at all – this was November of last year. In December, I participated in a workshop, as there wasn’t much to do on the organizational side. I was in a group with two other girls and two coaches – it was a great group, so we started to meet outside the workshop. After meeting for two or three months in a row, I decided to give coding a chance. I started by learning at home and then heard about the Rails Girls Summer of Code. I met Ute, who became my partner, and we applied and got accepted. We participated in the program for two months, which was amazing and we learned so much. Now I work at DaWanda as a Student Web Developer for their dev team. Laura: I didn’t have coding experience either, I used to study anthropology. I wrote my bachelors thesis on how women create their own spaces in IT. When I stumbled upon Berlin Geekettes and Rails Girls Berlin, I decided to write my thesis using the Rails Girls as a case study. An overarching theme in my thesis was that more women should be involved in IT, so when I was done with my anthropology BA I thought, “why don’t I just go into IT?” So then I started studying computer science, which I’m still working on. I have reached the level where I could coach the Rails Girls but I’m busy with organizing for the group. I have already done a project in Rails for Uni. How long does it take to get to the level where you’d be comfortable to coach at Rails Girls Workshops? Magda: Actually there are two girls here today that started not so long ago; they came to the Rails Girls Beginners Workshop and then attended Ruby Monsters and they’re coaching for their first time today. Laura: I think if you’re really into it, half a year to coach is sufficient. Coaching at Rails Girls also doesn’t mean you have to know everything, you just need to go through a tutorial and be willing to try. Can you tell us what the main objective of Rails Girls is – not just the overarching idea behind the project, but also what it means to you and what you’re trying to achieve by participating? Laura: Rails Girls started out in Finland in 2011 as a one-time workshop, but then turned into a recurring thing and spread to other cities. Each chapter is different due to the varied people involved in different cities – they make it their own. The idea behind Rails Girls, for me personally, is to take away the “magic” from programming because it’s not “magic”, its a tool you can learn in order to do things. Its a language you can learn, just like any other language. Women can do it and men can do it and its not confined to nerds and people with no social life, as is popular belief. That’s the other great thing that the workshop does: It shows that people who are coders are not anti-social, they are great people with normal social lives. Magda: It’s about breaking stereotypes. In every aspect, the project is focused on women, as they don’t commonly participate in IT in Europe. Rails Girls is definitely empowering women through learning, which is absolutely free. So the project is completely voluntary. How difficult is it to find coaches to spend their Saturdays or evenings coaching Rails Girls? Laura: We’re very lucky here in Berlin that there’s a large scene of Ruby developers, many of whom are eager to help out. It’s therefore quite easy to find coaches. Finding organizers is a little bit more difficult due to amount of work involved in organizing an event of such magnitude, but we always have new people joining. Magda: We also have many attendees that after a while turn to coaching and this is the real success indicator. What would you suggest to a girl wanting to learn to code as the best way to get started? Maybe you can tell us about your favorite meetup groups or working spaces in Berlin? Laura: There is co.up, which is a coworking space in Kreuzberg. It’s generally a place for freelancers to work, but you’ll probably find a few people who will help you out there. I would also suggest joining a Rails Girls Project Group because they meet more often, about once a week, so you can learn continuously. These groups are self-organized and they work on projects such as creating apps. In Berlin there’s also a project called PyLadies, which teaches girls to code in Python. Open Tech School Berlin is a mixed school with plenty of interesting events for any gender. In addition, there is the monthly Ruby User Group Berlin where you’ll always find new input, even as a beginner, and very supportive people. In closing, could you tell us how your life changed since you started coding and joined Rails Girls project? Why is it worth it? Magda: It’s definitely worth trying to code, even if you don’t like it and don’t continue with it at a later stage. Maybe you don’t end up changing your career, but do a project on the side. You’ll definitely enjoy being part of an exciting project group and learning something new. It’s also incredibly educational, you learn a different way of thinking and problem-solving which you can apply in other domains of life. Laura: Society tends to tell women and girls that they’re not able to do technological jobs or that they’re not able to do math. Firstly, I learned you don’t need to know mathematics to be a good programmer – maybe to be an awesome programmer, but you can be good even if your knowledge is not exceptional. I actually enjoyed math for the first time once I started learning computer science because I saw how I could apply it in day-to-day life, unlike school algebra where you just did it for the grades and hated it – at least I did. Society tells you that you can’t do it, so prove to everyone that you actually can!